Degrading proteins as opposed to inhibiting them has potential to open up a novel area of drug development. I first wrote about the protein-clearing technology last month when Merck and Arvinas inked a $434 million deal. Last week, researchers at Dana-Farber Cancer Institute reported details in the latest issue of Science. The authors attached JQ1, a BET inhibitor, to phthalimide, a derivative of thalidomide. The phthalimide was designed to bind to CRBN, part of an ubiquitin ligase complex. 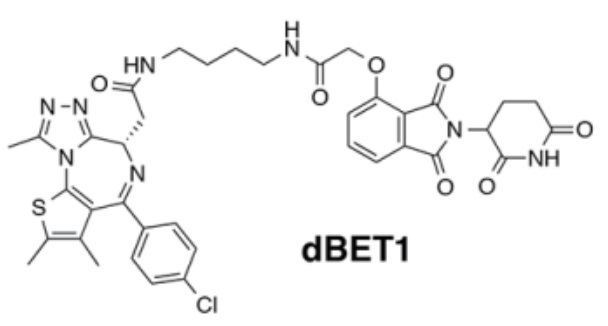 The resultant compound, dBET1, induced CRBN -dependent BET protein degradation. They next treated leukemia cells (MV4;11) and lymphoma cells (DHL4) with dBET1. Marked degradation (76%) of the target protein was observed at 1 hour and complete degradation was observed at 2 hours of treatment. dBET1 induced an enhanced apoptotic response compared to JQ1. The researchers then treated tumor-bearing mice with dBET1 (50 mg/kg). Degradation of the target protein was observed 4 hours after a first or second daily treatment. In mice model, dBET1 also resulted in improved anti-tumor efficacy compared to JQ1. It is not uncommon that inhibiting a protein is not always functionally equivalent to knocking out the protein. The protein-clearing technology is a feasible approach to reproduce the phenotype of knockout. Most patients prefer to take a drug orally instead of getting an injection. However, a large majority of biologic cannot be given as a pill. Carl Schoellhammer, a MIT graduate student, invented a microneedle pill that may replace injections. On May 21, Schoellhammer won a $15,000 Lemelson-MIT National Collegiate Student Prize for his invention. 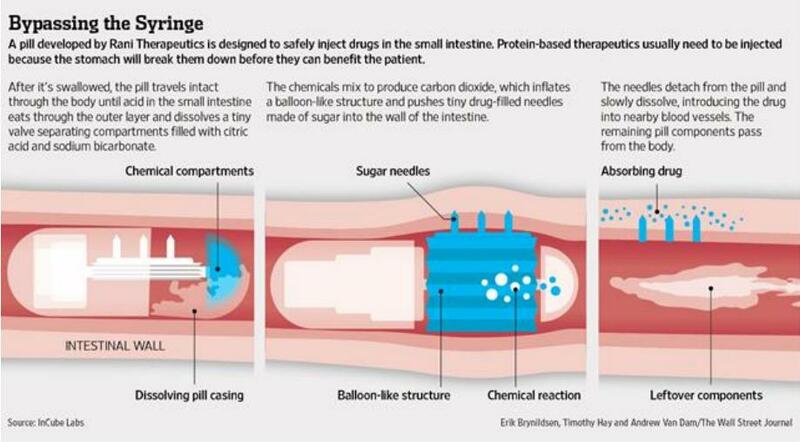 The system uses a capsule coated with tiny needles in order to inject drugs directly into the lining of the intestine. The capsule is 2 cm in length and 1 cm in diameter. It is coated with a series of stainless steel needles about 5 mm in length and 0.5 mm in outer diameter (25G). The needles are protected by a pH-responsive coating that dissolves upon reaching the intestine. Fig 1. Carl Schoellhammer’s microneedle pill. Because there are no pain receptors in the lining of the gastrointestinal tract, patients would not be aware of the microneedles injecting the drug. Schoellhammer has tested the capsule in pigs with success in both safety and results. The capsule could be used to deliver a broad range of drugs currently limited to injection. Rani Therapeutics, a spinoff of InCube Labs, is developing a similar microneedle pill. The company is funded by Google Ventures, InCube Ventures, and VentureHealth. Rani’s capsule uses degradable sugar needles instead of stainless steel needles. The drug filled needles could be pushed into the wall of the intestine by carbon dioxide produced by citric acid and sodium bicarbonate. Fig 2. Rani Therapeutics’ robotic pill. J Pharm Sci. 2015, 104(2), 362-367. Timothy Hay. Can ‘Robotic’ Pills Replace Injections? Wall Street Journal. February 18, 2014. Did GDF11 really improve muscle regeneration? In parabiosis experiments, the blood of younger mice seems to rejuvenate the muscles of older mice. In 2013, Dr. Amy Wagers, a biologist at Harvard University, seemed to offer an explanation for this effect. Wagers identified a protein called GDF11 as a circulating factor in young mice that declines with age.. Injection of GDF11 reversed age-related thickening of the heart. Two subsequent studies found that GDF11 improved blood vessel and neuron growth in the brain and reversed age-related dysfunction in skeletal muscle. GDF11 appeared to be one of the key components of the young blood. However, some experts were confused by Wagers’ papers, because GDF11 is very similar to myostatin, a negative regulator of muscle growth. Myostatin knockout mice have approximately twice as much muscle as normal mice. Could a very similar protein have the opposite effect? As early as 2009, Dr. David Glass at the Novartis Institutes for BioMedical Research showed that GDF11 could inhibit muscle growth. Who is right? Glass tested GDF11 levels in rats with the assays Wagers had used and found that Wagers’ assays could not distinguish between the monomer and dimer forms of GDF11 as well as myostatin. GDF11 levels actually did not decrease with age. Injecting GDF11 into mouse muscle did not improve muscle regeneration. Antibodies are among the most commonly used tools to detect target proteins. However, they are a major driver of reproducibility crisis. Commercial antibodies often recognize extra proteins in addition to the ones they are sold to detect. We need to have some changes in the field. Cell. 2013, 153 (4), 828-839. Am J Physiol Cell Physiol. 2009, 296(6), C1258-1270. MET, also known as hepatocyte growth factor receptor (HGFR), is a popular anti-tumor target, just like other growth factor receptors (EGFR, HER2, VEGFR, PDGFR, FGFR, etc.). However, failures of onartuzumab, tivantinib, and foretinib have shaken many investors’ confidence. A new paper in the journal Nature reveals a deadly weakness of anti-MET drugs. MET is expressed not only by cancer cells but also by immune cells. The authors showed that neutrophils need MET to migrate through the vessel wall of inflamed tissues, where neutrophils exert anti-tumor functions. Met deletion in mouse neutrophils enhances tumor growth and metastasis. These findings indicate that anti-MET drugs may have both positive and negative effects on tumors. On the one hand, anti-MET drugs can kill cancer cells that depend on MET hyperactivation; on the other hand, anti-MET drugs blunt the anti-tumor immune responses of the neutrophils. Selecting the right patients is key to MET inhibitor development. The study suggests that patients that have high MET expression in neutrophils should be excluded in clinical trials.